Literacy Committee Having Another Impactful Year! Our club has supported local, national and international projects that promote literacy. For the second year in a row we worked in collaboration with the Dublin City Schools to purchase Story Works magazine subscriptions for 316 students at Olde Sawmill Elementary School (91 students), Thomas Elementary School (157 students) and Riverside Elementary School (68 students). The teachers use the lessons in the magazines to teach reading skills and it is a fun way to learn. There are also on-line lessons that can be used with the magazines covering a variety of topics. 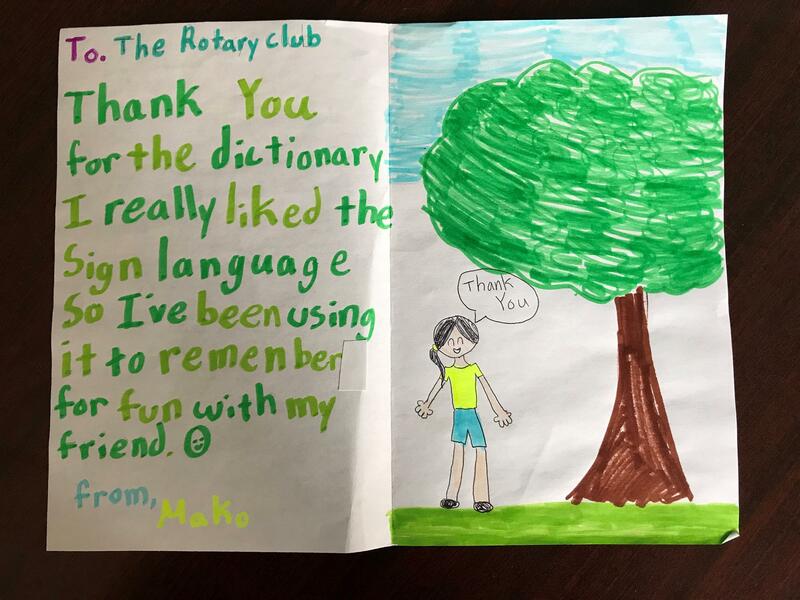 For many years our Club’s Literacy Committee donates dictionaries to 3rd graders in the Dublin City School District who can benefit from utilizing the dictionaries for word recognition, word finding and learning definitions of new words. This year the school district requested that we provide donated dictionaries to all of the 3rd graders at Indian Run Elementary. Some of the thank you notes we received from students are attached to this e-mail. We are excited to report that our Literacy Committee is working with the Dublin Library to create a book collection for young children that will focus on the Rotary’s values of inclusion, kindness, respect, giving, empathy and love for our neighbors. Our Club provides an annual donation of $500 from the Club President’s budget to fund literacy initiatives at Daniel Wright Elementary. This donation will be presented to Daniel Wright’s Principal and Librarian at a Club meeting this spring. We also contribute to a Book and Magazine Drive for Dublin Methodist Hospital. If you would like to join us, please contact Julie Erwin Rinaldi.